Expensive, exclusive and inconvenient, a regular round of golf in Hong Kong is an almost unreachable luxury. But now, the recently opened City Links Golf Lounge is bringing the golfing experience to the heart of Central – combining it with arguably the sport’s finest aspect, the 19th hole. Armed with four Full Swing simulators, the cutting edge of golf simulator technology, City Links is surprisingly the first public golf bar in our vertical, space-hungry city: a lounge where golf enthusiasts can enjoy a round as well as a beer. Strike the ball into the simulator’s projected golf course image before you, and, by some magical wizardry of science, your stroke appears on the screen. Voilà – virtual golf. Sixty-eight of the world’s finest courses, including the iconic Pebble Beach and St. Andrews (and, in the next year, our own course at Fan Ling), are available on the simulators, which provide those added extras that only technology can provide: fly-over cams, accurate shot distances, and mulligans, as well as the eradication of lost balls and the occasional ‘foot wedge’. It’s also incredibly time efficient as well – we’re told, without the walking of the real game, you and a couple of friends can finish a round in two hours. And you need worry about nothing: clubs, balls, and other equipment are all supplied. You need only bring your ‘A’ game. Sure, it’s not exactly like the real thing – it can’t recreate the serenity of being out on the course, and perspective is a little tricky – but it’s a surprisingly authentic golf experience that will likely win over even the skeptics and traditionalists. Indeed, City Links is a bar where the booze takes a back seat. But even so, the drinking environment blends simply and appropriately into the sporting focus. On either side of the long, softly lit bar opens two areas: a shiny, modern golf-themed room, where bunker-shaped lights and golf ball-studded walls fill the loungey space – a design that could easily have sliced off into the hazardous area of kitsch, but has been kept within the parameters of Wyndham Street sleek; and an open standing area, which, overlooking three of City Link’s simulators, acts like the public gallery. Both areas can be enclosed for private function, which, no doubt, many corporate clients will be keen to take up. Golf will be the main drawcard for most punters, but there’s a drinks selection here to keep everyone happy, from wines by the glass (starting at $55), Asahi and James Boag’s among the beers ($50), and even signature, golf-focused shooters like the spicy, Tabasco-, Blue Curacao-, and tequila-fuelled Fire in the Hole ($50). 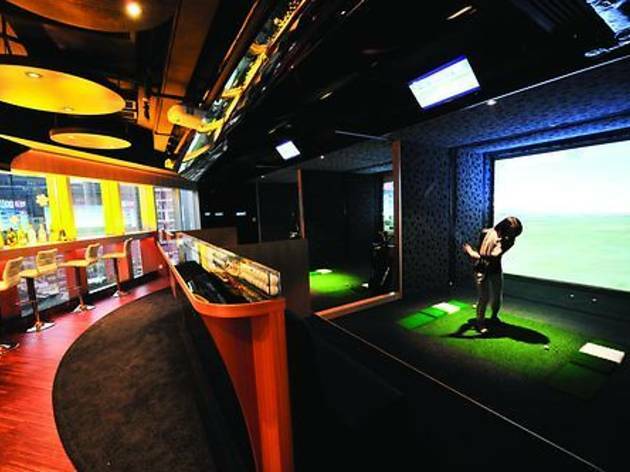 Whether you’re an absolute novice looking to learn the game (they’ve got a pro on site for lessons), or a seasoned low-handicapper looking to hone your skills, City Links provides a pressure-free environment to enjoy a game that, until now, has been inaccessible to many Hongkongers. 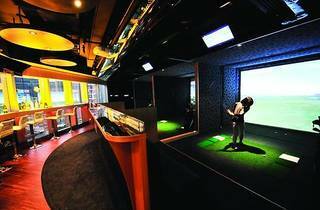 10/F, The Centrium, 60 Wyndham St, Central, 2522 6366, www.citylinksgolf.com. Prices start from $290/hour.